The best way to understand the payment flow is to log into a Portal yourself and do a test payment. This allows you to see things from your parents' perspective. Create your own family as a test family. Post a fee for $1.00 to the family. Add a Billing Contact with a valid email address that is your own. You can enter your credit card information or bank account information under the Billing tab, or, you can wait and enter it in the Portal. Use the Reset Portal Password button on the Contact page to generate a temporary password. You can also use the Reset Password link on the Portal login page. Remember, you can access your portal from within your database BEFORE it is placed on your website by going to Tools > Parent Portal, then clicking the Go to Parent Portal link in the upper left corner. Log into your portal. If you did not add your credit card or bank account information in Jackrabbit go to the Billing & Payments option in the top menu to go to the Account page. Select Saved Payment Methods. Click the '+' button and enter your own credit card information. Back on the Account page click the green Pay Now button. 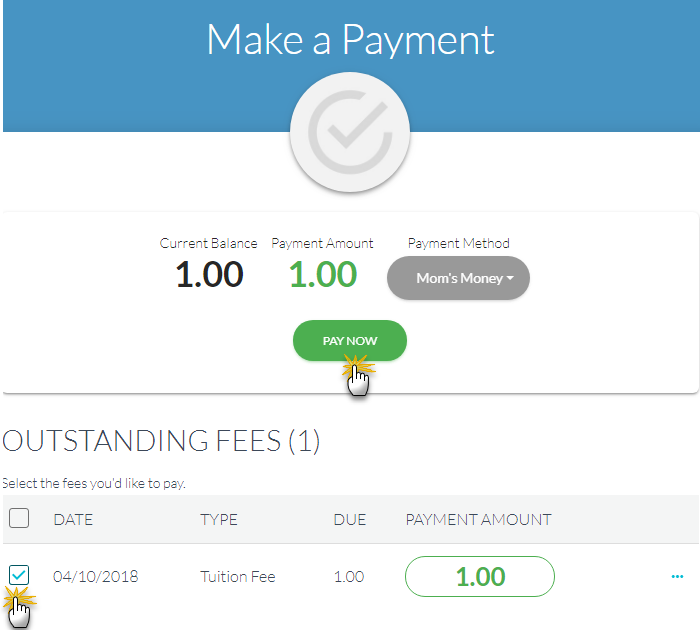 On the Make a Payment page select the $1.00 fee and click Pay Now. Note: This will actually charge the credit card and send the payment through your gateway and to your merchant processor. 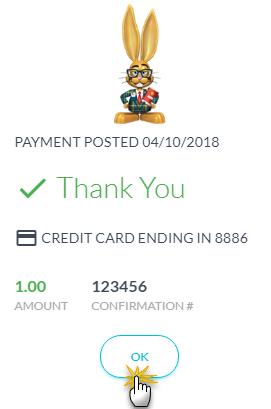 In the Confirm Payment window, click the green Make Payment button to complete the payment. A window will display the credit card's last 4 digits along with the amount paid and the confirmation #. Click OK.
Back in your Jackrabbit database, on the Transaction tab of the family's record, you can see the approved payment. Run the Parent Portal Log (Reports menu) with the word "approved" in the Filter Text field and it will provide you a list of all approved portal payments during the date range you specify.